Deuce lives in College enclave, underground in a part of NYC’s abandoned subway system. Long ago she learned from her elders that the world above is uninhabitable. Therefore, she follows the strict rules dictated by the leaders of her enclave, knowing that only within its tunnels is she safe. Not only protected, but important: a Huntress, the only job she’s ever desired, the only identity for which she’s lived. Aguirre has written a formidable protagonist in Deuce. Deuce has trained since she was young to hunt for the enclave, guard its citizens, and to kill Freaks (monsters who feed on human flesh, but don’t seem to be undead). She’s also learned to store her emotions–and any curiosity about life beyond College–so she can be the best Huntress possible. However, blade and boot seem to carry Deuce only so far. Her name itself, based on the two of spades, shows she may have more than one path to follow as she’s hurtled from one challenge to the next. Enclave, though ostensibly about a post-apocalyptic landscape and its survivors, also calls the reader to think about the dual nature of oneself. Aguirre depicts this not only through her characters’ actions, but by a binding tale woven sparsely throughout: a story by George MacDonald called The Day Boy and the Night Girl. It’s this attempt at knowing and understanding the world as a whole, and herself, that kept me cheering for Deuce throughout Enclave. Her love interest, Fade, and others she comes to know, also display this yearning for truth in their own ways. We readers want to know why, too. 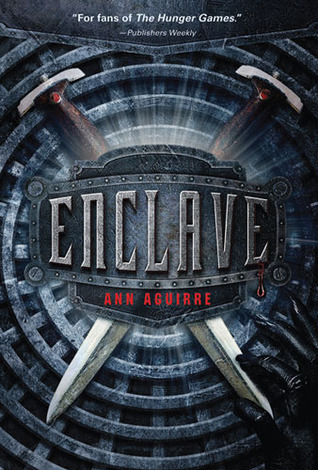 Enclave will have at least one sequel, so prepare yourselves for more Freaks and more adventures–and hopefully, more of the same insight each character has gleaned in this first book. I’m excited to see where Aguirre takes us next!